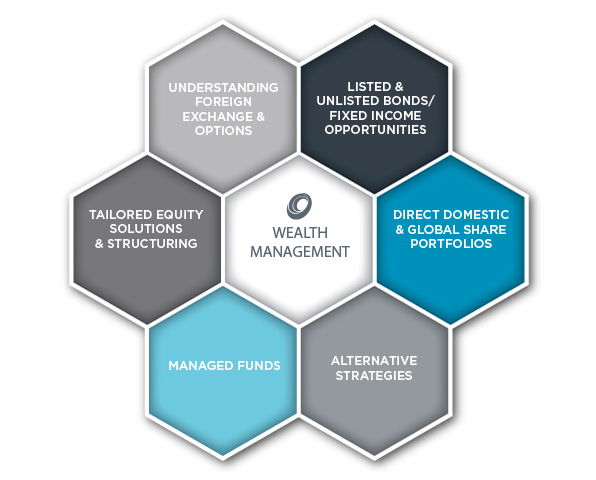 Our unique investment capability is one of our core strengths – with our disciplined, consistent and deeply considered approach being fundamental to our investment decisions. We aim to create tailored portfolios based on the risk and return objectives of each client. We base our investment decisions on discipline, consistency and a deeply considered approach. Our Investment Policy provides further details on how our in-house investment capabilities add enormous value to our clients. Fixed Income investments such as bonds often make an important and stable part of an investment portfolio. It is an integral part to achieving a stable income but can also help smooth returns and volatility in a portfolio. However, fixed income is not as plain vanilla as the average investor often imagines. Investors need a good understanding of the macro-economic environment and where interest rates are heading over the medium to longer term. We use various sources to gather this information as well as our own in-house assessment of the likely scenarios in order to make adjustments in the type of fixed income and strategies used in portfolios. Our clients have come to expect that their portfolios come with a degree of direct holdings in quality companies listed in Australia and abroad. Our unique capability in offering both Australian and International direct share ownership allows our clients to tap into some of the very best brands and companies in the world that are often unavailable to the typical clients. We use a range of filters and tools to enable us to only assess companies that meet our quality criteria. We then gather information from various sources in order to understand their valuation level and whether their future is bright enough to convince us to take the risk in having our clients invest into them. Alternative assets can often be confusing to most clients. As a general definition, alternatives is an asset class that should assist and complement the portfolio when markets trend sideways or down. We use a select group of strong managers who are able to place uncorrelated bets on the market by actioning unique strategies to assist our clients in preserving capital during market downturns. How do you sort out the best from the rest in a world where there are thousands of choices to choose from? Financial Decisions has direct access to most of the portfolio managers and thereby attains a much deeper understanding of how their minds work and whether or not our philosophy aligns with theirs. Having a true understanding of how they act and react to certain situations can assist us to separate the best from the pack and allows us to choose and blend together the most appropriate funds to place into your portfolio. This is a unique offering from Financial Decisions to our clients. Through our deep understanding of many aspects of market volatility, we are able to structure unique investment opportunities by combining equities and options as a package in return for a fixed set of return. No investment comes without risks but during certain times of the year, we can offer certain strategies to enable clients to receive a high level of income. We package an investment structure that we believe has the best risk to reward by understanding probability scenarios combined with the fundamentals of the underlying companies to package a high probability investment often with double digit returns. Foreign exchange (FX) requires many years of experience as it involves an ability to combine a fundamental outlook over a short to medium term timeframe on the economy as well as a solid practical knowledge of technical analysis. Options require a very solid knowledge of the different aspects that can affect its pricing. While we do not do direct option strategies for our clients, some of our strategies require a very good practical knowledge of the impacts of how movements in the underlying asset can impact on the option premiums. We can take advantage of these to make money for our clients. Both FX and options are complex but important fields requiring a lot of patience and understanding in order to execute well. Financial Decisions is one of the very few financial advisory firms with this capability in-house.